Serendipity, a trigger of exciting yet unexpected discoveries, is an important but comparatively neglected factor in information seeking, research, and ideation. We suggest that serendipity can be facilitated through visualization. To explore this, we introduce the Bohemian Bookshelf, which aims to support serendipitous discoveries in the context of digital book collections. The Bohemian Bookshelf consists of five interlinked visualizations each offering a unique overview of the collection. 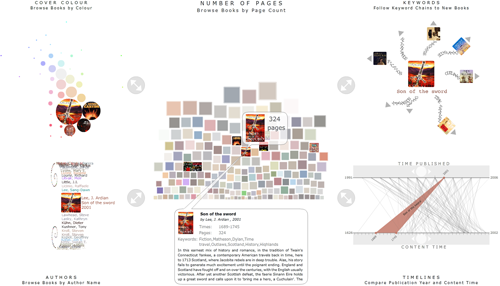 It aims at encouraging serendipity by (1) offering multiple visual access points to the collection, (2) highlighting adjacencies between books, (3) providing flexible visual pathways for exploring the collection, (4) enticing curiosity through abstract, metaphorical, and visually distinct representations of books, and (5) enabling a playful approach to information exploration. 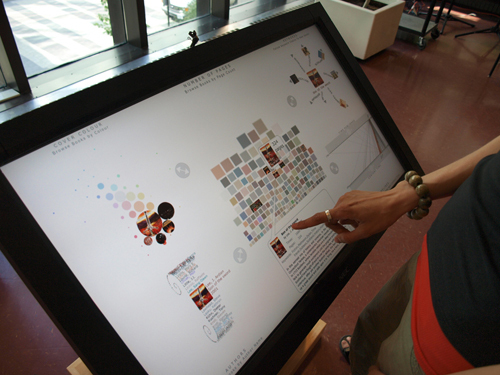 A deployment at a library revealed that visitors embraced this approach of utilizing visualization to support open-ended explorations and serendipitous discoveries. This encourages future explorations into promoting serendipity through information visualization. Alice Thudt's Bohemian Bookshelf project page and online demo. Uta Hinrichs' Bohemian Bookshelf project page. Alice Thudt, Uta Hinrichs and Sheelagh Carpendale. The Bohemian Bookshelf: Supporting Serendipitous Book Discoveries through Information Visualization. In CHI '12: Proceedings of the SIGCHI Conference on Human Factors in Computing Systems, 2012.